I watched Beowulf again recently and one of the things that has been remarked is that Beowulf appears boastful on his first visit to Hrothgar's hall. In context, it makes sense. The modern desire for modesty is out of place at the start of the Dark Ages when heroes had to be heroic and sway desperate kings to their cause - heroes didn't provide resumes, business cards or flashy websites. 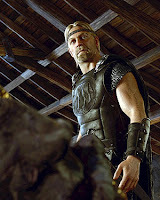 The presence of Hunferth provides a counterpoint to the hero's oratory; conflicting with the story and forcing Beowulf to shout down the friend of Hrothgar and then prove his bravery and might against Grendel. Naturally the story shows our hero isn't making idle claims to strength, valour or determination. That's not to say he's flawless, this interpretation reveals the ambition and lust that keeps him from becomi ng completely sympathetic. Previous posts on characterisation help pick out Beowulf's defining characteristics. In this, both Neil Gaiman and Roger Avery provide the meat of this character and season it with modern sensibilities and poetic justice while remaining mostly faithful to the core idea of the epic. Yes, he should kill Angelina Jolie after a fierce battle - in this version, she's more a curse of temptation in high heels and gold body paint. Beowulf is a man's man; athletic, skilled in battle, forceful in speech and a leader of warriors; his attributes are apparent. It's not until his time as king that his understanding of reputation is apparent (sparing the life of a raider so he can spread the story of how Beowulf spared him) despite believing he cannot die. This shift in tactics shows Beowulf's leadership qualities as well as acknowledging his being trapped without challenge which chafes his heroic nature. How would your hero seek to promote their deeds while remaining true to themselves? Or how will they cope with 'happily ever after' when it's not all it's cracked up to be? This shows attributes need not just be physical qualities, they can also be personal qualities - they can inform motives (what Beowulf wants moves through the story) and attitudes. The soldiers of Denmark claim their king cannot die and this haunts Beowulf until the appearance of the dragon. This attribution of immortality haunts the king, particularly in a culture that held death in battle as the noblest end. Giving an unwanted label (attribution) to a character can drive some powerful stories. I also wanted to thank you for including my blog in your list of Malcontents. You've got a good blog going on here yourself and I'll have to stop by more often.